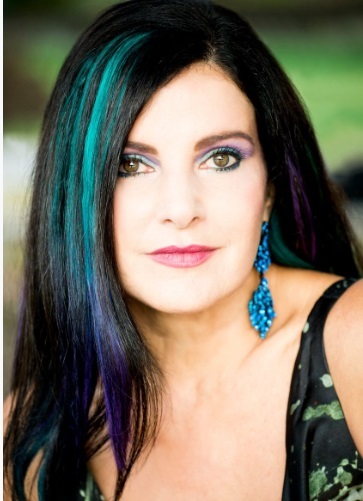 Concetta Antico, also known as The Color Queen, is a gifted visionary artist, color consultant, teacher and Tetrachromat. Backed by science, Concetta’s super vision allows her to see 100 million colors, this is 100 times the amount that normal vision people can. Concetta possesses rare genetics which provides a 4th color vision receptor in her eyes. Her gift combined with her lifetime immersion in fine art, as both an educator and muse, take her beyond known art. Her stunning original art unites nature through a style of heavenly color and dynamic brushwork. 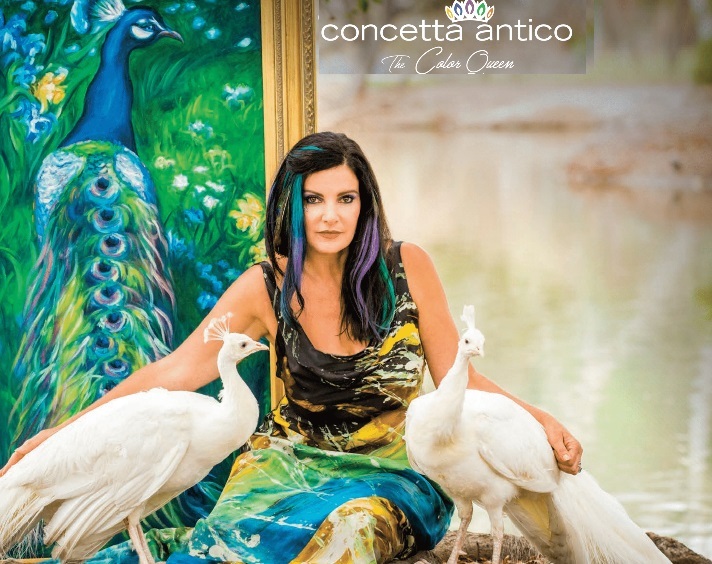 Concetta has more than 1,000 original pieces of art in private and corporate collections around the world. She is also the ongoing study of scientists in the field of color vision at UCI in California. 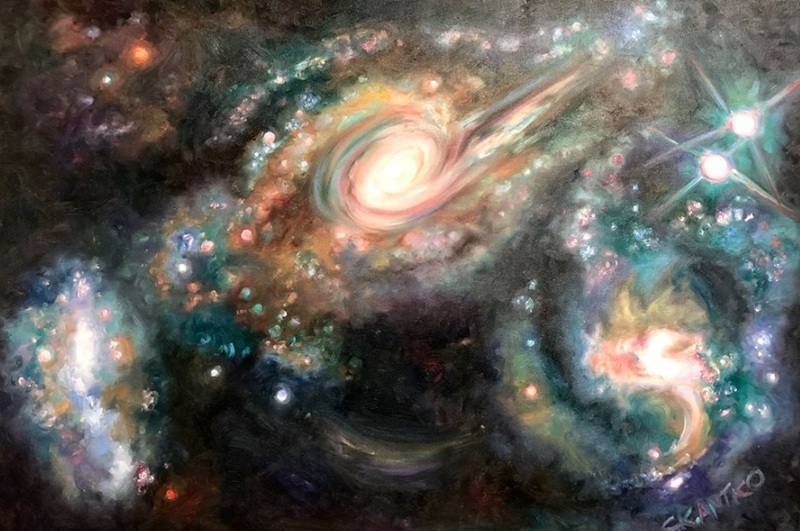 For more information on Concetta’s gift and artwork, please visit www.ConcettaAntico.com. Creativity was in my blood. 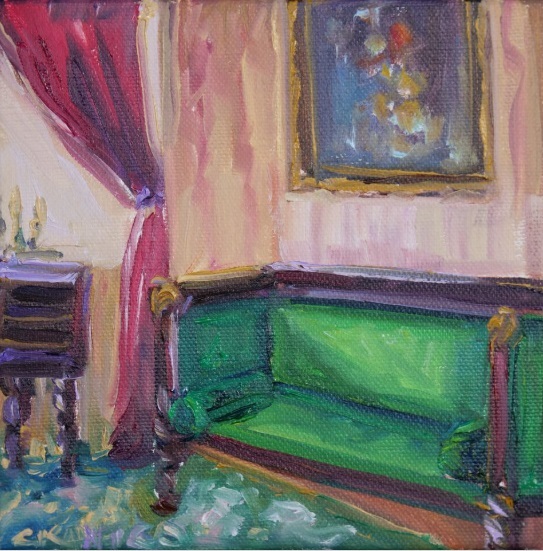 I started painting with oils at age 6 – my mother bought me a professional easel and oil paints – by age 10 she told me I would be a great artist and teacher. My life vision never sidetracked – I was on a quest to change the world through visual art and instruction. In the mid 90’s I started my school The Salon of Art and taught over 25K people of all ages how to paint. It is my second nature – it may be my first! I have the soul of an artist – I was born with it. Whether it is artistically inspired food, hair, cosmetics, clothing, interiors, experiences or education, companies and individuals alike are placing their color and creative spins onto everything. What we like, buy or do must speak to our own souls to be authentic. We are realizing that we are all intrinsically creative and want to place our own self- expressive thumbprint onto everything we do. Brands have found that it is a way to speak to the individual in us all as nothing can add the fluorescence of individuality to our lives as our own choice and expression. 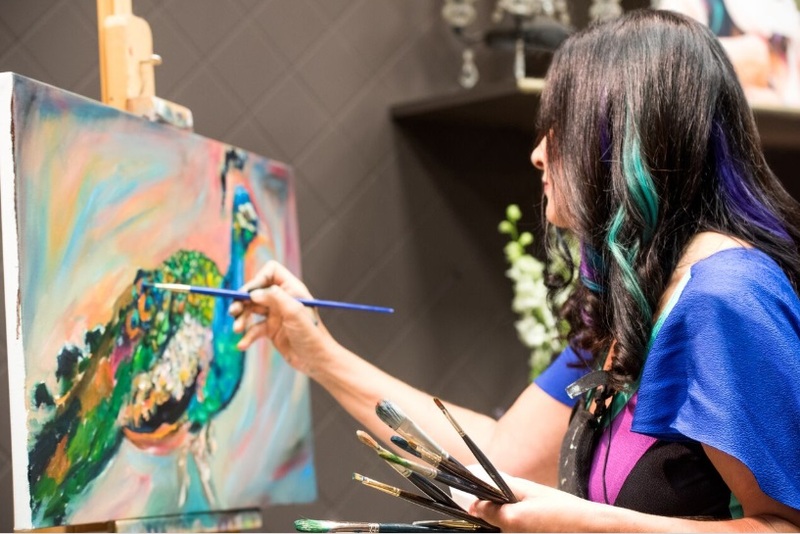 Creative directors and concept gurus are learning that fine art and color are influencing buyer who are thirsty to create their own life canvas. Art is also highly spiritual and as we move into higher consciousness, humanity wishes to speak their own creative prayer. Lightworkers not only want light, they want uber color and design. As art is second nature to us, the opportunities for it to take a massive role in our lives is ripe! A more challenging aspect is that we don’t all view the colors of our world in the same way. I am a testimony to this as an X-Woman with Super Vision called Tetrachromacy. Seeing up to 10 million more colors means that what I look at that is man has created must support my gift and expanse. It doesn’t. Thus, new color frontiers and scientific advances in how we see are having a huge impact also on our technological sector as they now have greater evidence that we do not all see alike ad that visual stimuli need to be catered to offer maximum effect. This is particularly apparent in film, digital technology, cameras, and any device which supports a screen from TV’s to Apple watches! Consumers are demanding more color choices and becoming ore savvy with their selections. In an evolutionary and awareness step, and as Color drives up to 85% of purchases – I would say the challenges are unlimited. As I have been immersed in color my entire life – my desire to see other’s swimming in it too has always driven me. I used to see folks out in nature – in parks and breaches where color is paramount – yet they were not “looking” at it. It occurred to me that they needed education – to learn to SEE more color, detail and therefore, beauty. This was my inspiration to share my gifts with the planet. As a spokesperson and unique Color Queen, I hope to lead a revolution of creativity and color in every industry. I wish to be the Muse, the collaborator and the spokesperson for MORE color in our world and in all we see and do. I believe “More Color is More Life”. I am here to as a magical force of nature, a rainbow unicorn, to lead the way, to educate and to inspire. My Super Vision can influence every business’ color philosophy and research capabilities. Several new research papers are forthcoming in scientific publications this year from Dr. Kimberly Jameson and UC Irvine about my Tetrachromatic abilities and why color varies and matters will shape much in our color world. It will change the paradigms as we know them. The new color palette is about to mix it up a lot! I wish to be the world spokesperson on the TRUE COLORS of our world and the universe beyond. As The Color Queen I can endorse what is real and authentic. Scientifically. I am already working with several companies who create products which measure and define color. I have consulted with several companies in the cosmetic industries. What I am able to do with color and their creations will be groundbreaking and disruptive. My DNA, tetrachromatic geneotype, blood work along with other medical data is being used in high level scientific eye research as I write this. Why they are looking into growing a replica of my retina in a lab! My mutation stands to definitely change lives, but more importantly will save lives too. Any new entrepreneur knows the dangers of start-up with a new concept. I threw my gift into the idea and everything I owned. I was a trail blazer in the realm of fine art instruction being the first to bring it to shop front where you could “buy” it. Hanging my shingle over the door of my new business stating “Art Instruction Here” was a bold move in the 90s as the creativity bug had not yet bitten society in the way it has now. It took many years to gain momentum as the psyche of folks was cemented back then in “I can’t draw a stick figure” which is an untruth as all can. With no support or funding, there were many months that I was struggling for rent. I almost lost hope until a stranger came in and stated, “Don’t quit the day before the miracle”. It gave me hope and I never quit. When you have a vision you must be indomitable, never give up, ever. When I show a client or a company MORE color, to help them to see their color potential – the change is dramatic. More color and correct color and great influencers of excitement and joy. Who doesn’t want to be able to experience more beauty and color resonance? It is life changing, it is product changing. You can LEARN to SEE more. Regular vision can see up to 100 million colors, with my education my clients experience enhanced color vision. By consulting with my 1000 million more color expertise – companies can take color options into the next galaxy and beyond. They can offer more choices and create a more powerful offering. Groundbreaking color and color options are on our horizon. That’s exciting!! As a fine artist who can not only SEE but can PRODUCE more color though my oil paintings, I offer a window into the world and it’s beauty that could not be seen and be believed otherwise. I inspire more color. I can show more color and define it for others to learn to see it too. Then they believe. They become color seekers. The scientific research stamps my gift. Industries involved in color must now believe the findings and the worldwide press endorsements and lead the way. I will be there to guide them to the subliminal color that underlies everything we look at. Believe in your own truth. Live your passion. Be relentless in the pursuit of your dreams. Follow your intuition to realize the magick which is inside and all around you. Be creative – think out of the box you may have found yourself in. There are no barriers, only those you place around your own imagination. Be happy in every moment of every day and be grateful for it. It is all, every second of it, a gift.